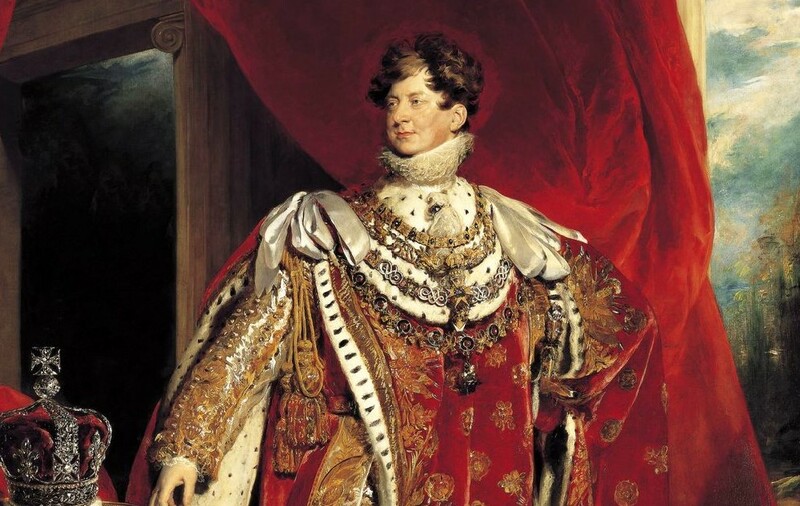 George IV – Inveterate voluptuary or planning genius and unfortunate victim? ‘There never was an individual less regretted by his fellow creatures than this deceased King.’ Thus began The Times obituary on George IV in 1830. It went on to describe him as ‘selfish’ and an ‘inveterate voluptuary’, and in so doing probably reflected the majority view of the population. George IV’s lifestyle made him deeply unpopular. He drank, ate and spent to excess; flaunted his mistresses; gambled; and was deeply offensive to his ‘official’ wife, Caroline of Brunswick. He lavished vast sums on creating Carlton House and other residences, and on the furniture and artworks which adorned them. He was particularly unpopular with the expanding, straight-laced middle classes whose taxes funded all this and for whom his costly passion for art was synonymous with waste and licentiousness. This Royal ruler had the misfortune to live during a flourishing time for cartoonists who lampooned his lifestyle and waistline mercilessly. Both King William IV and Queen Victoria distanced themselves from George’s spendthrift ways and historians writing about him in the years after his death had no kind words. But there was a sea change in the twentieth century. Historian Clifford Smith, writing in 1931, said: ‘He was possessed of much taste, a fine intelligence, practical abilities and immense energy’ … and that ‘he proceeded with a despotic determination to provide the English Capital with a harmonious and beautiful appearance’. George was a driving force behind Regency London. As City of Westminster Guides, we should be grateful for the material he has supplied for our walks and talks. He wanted to create a city worthy of being the capital of a victorious empire. In his protégé, John Nash, he found an architect able to deliver this vision. George’s brief simple: outdo Napoleonic Paris! This led to the most dramatic exercise in town planning London had ever seen and the creation of the top tourist sights of London. A royal quarter was developed around The Mall and St James’s and with that came some of the most stylish streets in the world. 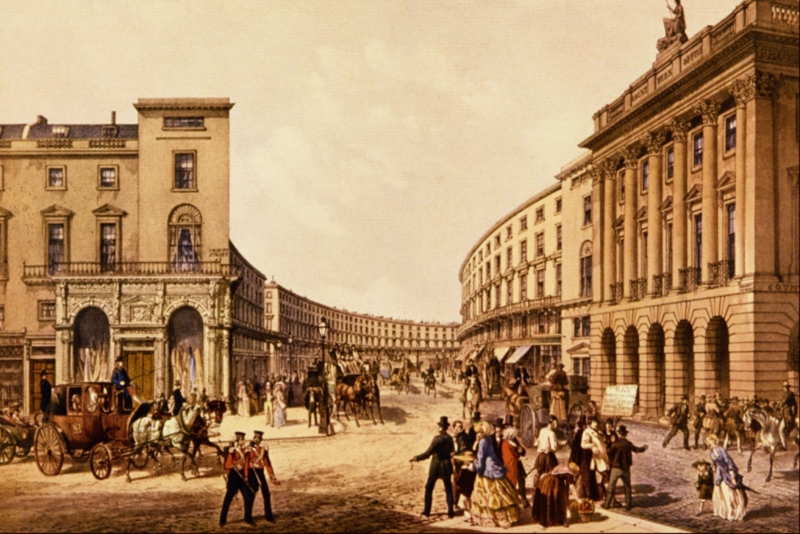 Without Nash, spurred on by George, we would not have the impressive vista from Waterloo Place to Piccadilly Circus, St Martin-in-the Fields would be hidden behind houses, we would not have the sweep of Regent Street (surely the most elegant shopping street in the world? ), nor would we have Carlton House Terrace (described by Pevsner as ‘the greatest terrace houses ever built in Britain’) standing imperiously at the end of The Mall overlooking St James’s Park. There is a lot more besides. It’s easy to overlook these places because they are part of the fabric of the London we know, but we should not underestimate the achievement or impact of the transformation of narrow dingy streets. This is captured by a foreign visitor, Prince Puckler-Muskau, who, in 1826, wrote to his wife: ‘London is . . . extremely improved . . . Now, for the first time it has the air of a seat of Government and not an immeasurable metropolis of “shop-keepers”, to use Napoleon’s expression’. As well as grand residences and retail outlets, we have George to thank for the National Gallery. He persuaded the Government to buy John Julius Angerstein’s art collection – the basis of the artworks that are enjoyed by visitors all these years later. George was a discerning collector, which explains why the Royal Collection has so many great treasures. Looking at this much maligned monarch with 21st century eyes and without being burdened by his debt, it’s possible to be more understanding about the reasons for his behaviour. There was no affection shown to him by his father, George III, who imposed a very strict upbringing, isolated from society. If he had been born today, social services would probably have taken him into care. George’s reaction to his father and his upbringing was to rebel against everything his father stood for. I can’t say I blame him. He did what many teenagers do, but his teenage rebellion lasted into adulthood. He became part of the Devonshire House set, along with prominent Whig Charles James Fox. The pair ate and drank together and gambled late into the night at Brook’s Club in St James’s Street and at Devonshire House where they played cards with Georgiana, Duchess of Devonshire. Perhaps George was drawn to people like these because he knew his father would not approve of them. These friendships did indeed horrify George iii, not just because he disapproved of gambling and drinking, but because of the political leanings of the Devonshire House set. George snr was no fan of the Whigs or Fox, who had described him as a ‘tyrant’ and had supported American Independence. George’s behaviour was a manifestation of resentment against his father, fuelled further by George III’s refusal to allow his son a useful role. George IV would have loved an Army career but had to fill his time somehow, so spent it in pursuits which his father and the British people disapproved of. Despite being the cause of his son’s lifestyle, George iii frequently complained about his spending and his late rising. The Prince Regent replied in bitter frustration that he always found the day ‘was long enough for doing nothing’. Denied a military career, he did the next best thing and dressed up in military uniforms from all over Europe and promoted an image of himself as a heroic, successful commander. He falsified stories of battles he had fought in – even telling tall tales relating to the Duke of Wellington’s experiences at Waterloo! This fabrication was no doubt designed to win respect and a place in the nation’s hearts, which never happened. The bronze statue in Trafalgar Square by Sir Francis Chantrey was commissioned by George two years before his death. He is depicted as a Roman Emperor, a leader of men, on horseback, riding without stirrups. The reality was very different – George was grossly overweight, debilitated and addicted to laudanum. When Chantrey died in 1841, the statue was still in his studio and no one knew what to do with it. Eventually it was decided, as a temporary measure, to put it on one of the plinths recently created by Sir Charles Barry. In view of George’s role in the development of London, it is fitting it has remained there. I consider George IV a victim and a great town planner. How different his story might have been if he was one of today’s young royals who are free to marry divorced commoners, to train as military pilots and to do meaningful work for charities. I think George would have given his eye teeth to have been a royal now.